Nintendo has explained why the New Nintendo 3DS has launched in Japan, but won't come to the UK, US and Europe until 2015. 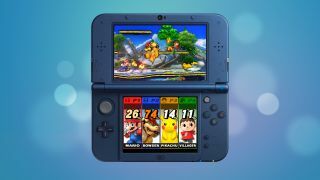 The New Nintendo 3DS could be an obvious Christmas smash hit in the US and Europe, but Nintendo has decided to ditch that potential in favour of a later launch for the new handheld. During a recent financial briefing, Nintendo President Satoru Iwata explained that in Japan, where the New 3DS has recently launched, 3DS sales slowed significantly while the US and Europe don't yet need the new model. "The overseas markets are different from the Japanese market in both their stages of popularisation of Nintendo 3DS and their market characteristics," Iwata explained. "Neither of the cumulative sales figures of Nintendo 3DS in the U.S. nor Europe is more than that in Japan despite, based on the historical performance, bigger sales potential. In short, Nintendo 3DS is still at an earlier stage of popularisation in these two markets." So either we in the West haven't bought enough 3DS handhelds to date, or are still buying too many, depending on which way you approach it. By comparison, Iwata makes it sound like the original 3DS is on its last legs in Japan. "In Japan, the total number of sales of Nintendo 3DS has reached nearly 17 million in the three and a half years since its launch. It is almost the same as the lifetime sales of GameBoy Advance released in 2001, which implies that it is reasonable that the sales of Nintendo 3DS have been temporarily slow moving in the Japanese market. This is one of the reasons we needed to bring New Nintendo 3DS/3DS XL to the market this year." Australia is to get the new handheld this year too, but the rest of us still have a while to wait. The main differences between the current 3DS and the New 3DS include much better battery life, interchangeable front plates and a second analogue stick. 3D performance has also been improved, letting you see the effect from a wider angle, and the New 3DS has a faster processor than the original. As part of the financial call in which we learned about the New 3DS disappointment, Nintendo also announced the 3DS series has sold 45.4 million units to date, which is pretty impressive.